A winter storm is forecasted to be hitting interior Alaska tomorrow. I'm hoping that we don't have any major problems. But in the meantime, this post has been keeping me busy for the last couple of weeks. Another 100% non-moto related post but I've been learning a lot. If we lose power during the upcoming winter storm, I may be getting some use out of the RV stuff to run the home heating system (oil fired boiler). 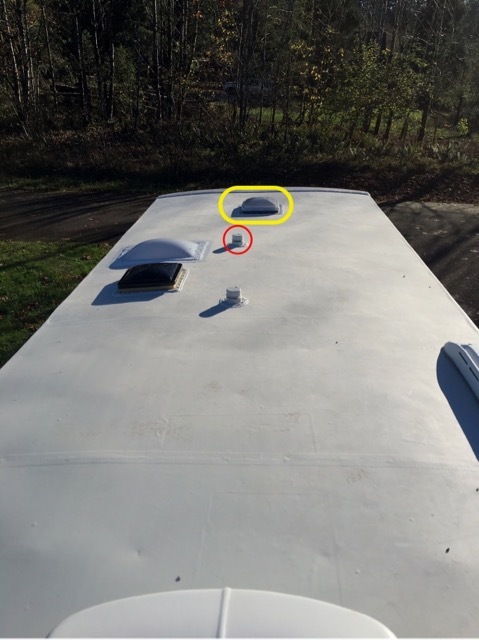 I have decided to install some solar panels on our fifth wheel RV. This post is sort of a continuation from my other posts on the comparison of PWM and MPPT charge controllers and 12 VDC Systems. And I'm not sure how many parts there will be. This picture was taken from the rear of the roof looking towards the front. There is a lot of room up there. The front vent pipe, circled in red, runs through the basement storage right behind the rear wall of the front battery compartment and through the bathroom wall next to the shower. The height of the interior wall is maybe about 6 1/2' and is the shortest run from the roof to the front battery compartment and the logical place to run the cables. The panels will probably be put in front and on each side of the front air vent (Circled in yellow). Unfortunately, I didn't measure the space or even take a picture of the area so I'm not exactly sure of the dimensions. I have been reading a lot about solar power installations and it is a real mix of information. Some good and solid others a mix of hearsay and personal opinions. But I guess that's pretty much the definition of the Internet. This post is a description of the solar system that I will be installing. Much of the stuff has been purchased already. Other items will need to wait until the rig is actually sitting in front of me but a detailed design needs to be done before a single screw is installed. That is the purpose of this post. It may seem odd to start with the inverter but it determines the size of the battery bank as well as the size of many of the bits and pieces of the system such as wire, fuses and switches. Not to mention how much solar you need to keep the batteries charged. Most of the product links are to the device on Amazon. 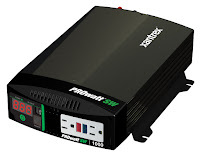 Inverter: Xantrex PROwatt 2000 true sine wave inverter. Rated at 1800 watts continuous. Maximum current Imax= 1800 watts / 10.5 VDC = 171 amps. 10.5 VDC is the minimum voltage before the inverter sounds an alarm and shuts down. Add in a 25% safety factor and you get 214 amps. Based on this, the catastrophic fuse, DC cutoff switch and the battery/inverter cables will be rated for at least 214 amps for a short period of time. The Xantrex recommends a 250 amp class T fuse and 2/0 or 4/0 awg for distances of up to 6'. Since my cable runs from the battery bank to the inverter will be significantly less, I will be using 2/0 wire. The ampacity of the 2/0 Cu wire is 283 amps and the voltage drop from the battery to the inverter would be 0.07 VDC. 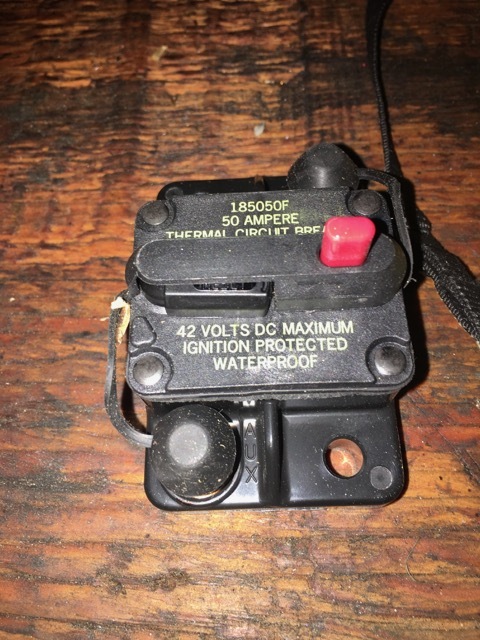 I will be using a 250 amp class T as the catastrophic fuse for the whole DC system and the inverter is, by far, the biggest potential consumer of power. Solar Charge Controller: After a lot of research, I picked up a Morningstar TS-45 PWM solar charge controller. Being a PWM controller, the input and output current will be the sum of Isc of the 12V solar panels. 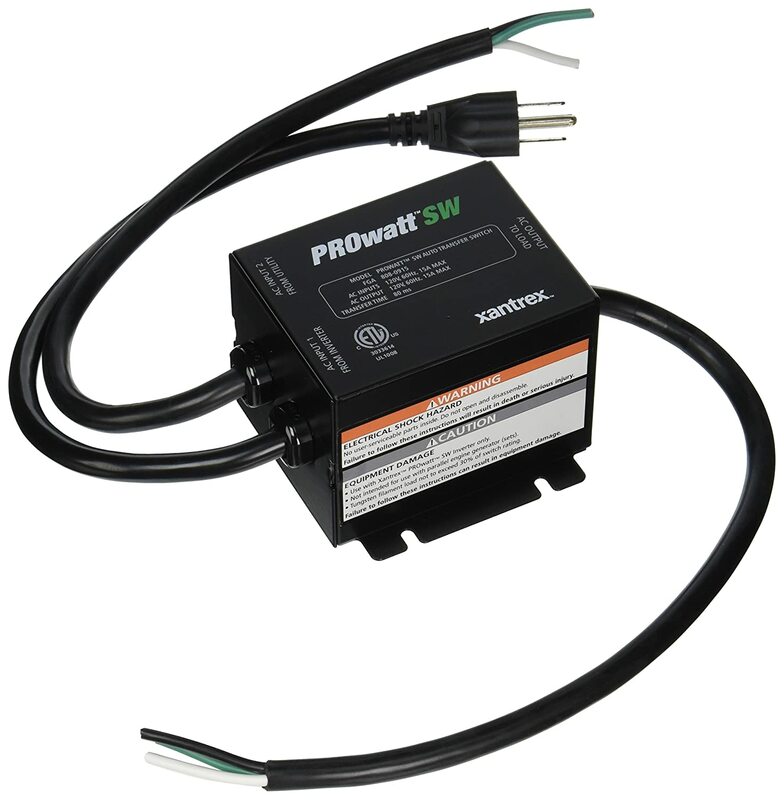 The TS-45 is rated for 45 amps and the input and output DC circuit breakers are rated at 50 amps. A benefit of the circuit breakers is that they can be used like a switches to isolate the charge controller. And the output needs to be connected to the battery before the panels are connected. The TS-45 has a temperature probe to adjust charge rate based on the temperature of the battery bank and a battery voltage sense wires to compensate for any resistive losses in the battery cables. Morningstar has been around for a number of years and this was strongly recommended for smaller installations. I was initially leaning towards the 30 amp Bogart Engineering PWM controller since it could tie into a Trimetric 2030 monitor to configure all sorts of parameters. I ended up getting the Trimetric 2025 monitor after deciding not to get the Bogart solar controller. But was still trying to decide between PWM and MPPT. MPPT is slightly more efficient and PWM is cheaper. Since this is a small solar installation, the efficiency gain from MPPT isn't really enough to matter. 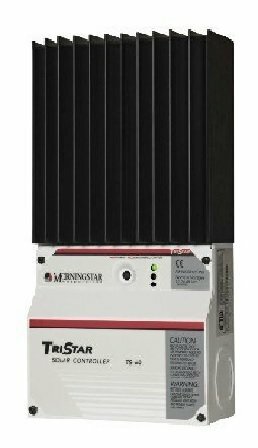 The Morningstar TS-45 was about the same price as the Bogart controller, has more growth potential (45 amps vs 30) and does offer not only an optional remote monitor but also has both an RS-232 connector and an EIA-485 connection. By adding the network option, you can even monitor and control through a web interface. For some reason, I find that option attractive. Several web sites mention that while a remote monitor may be cool to look at it really isn't needed. The Trimetric gives you much more useful information. By the way, everyone seems to recommend installing a Trimetric monitor even if you never go beyond that. The most useful mode is percentage of battery capacity left. Kind of like a gas gauge. Solar panels: Renogy 100 watt, 12V monocrystalline panels. Isc= 5.75 amps, Vmp = 18.9 VDC. The TS-45 could handle at 7 or 8 of these panels so Isolar = 5.75 amps x 7 = 40.25 amps. I do not plan to install this many panels at this time. But I like having the option. Maybe 4 for now but there is room for growth. The Isolar value will be used to size the cables from the combiner box on the roof down to the charge controller in the front compartment. You might notice that the rated output of the panel is 18.9 VDC x 5.29 amps (Imp) = 100 watts. With the PWM charge controller, the actual output of the panel into the battery will be lower as the current will remain the same but the voltage will be lower. 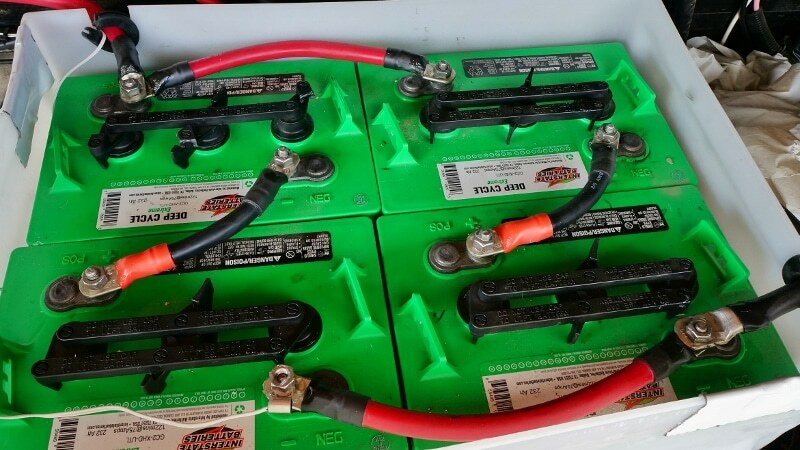 Battery bank: 4x6V golf cart batteries from Sam's Club. 215 amp-hours each yielding a battery bank of 430 amp-hours @ 12VDC. 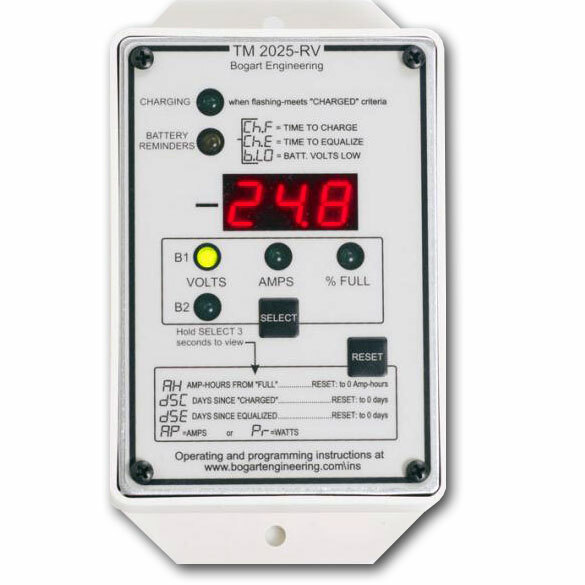 This photo is from LoveYourRV.com but I was able to find the same battery box locally. And these are Interstate batteries. Sam's Club carries Duracell and Energizer golf cart batteries which some dismiss due to their much lower cost. They are all flooded lead acid with about the amp-hour rating. The "gold standard" are Trojan T-105 and Crown batteries at more than double the price. I picked this photo since Ray is also using 2/0 arc welding cables for linking his batteries and the same size battery box. Each pair of batteries are wired together in series (i.e. negative to positive) so the voltage is added. Two 6VDC batteries in series equal 12 VDC. Then the two pairs are wired in parallel (i.e. positive to positive, negative to negative). This combination can be treated as a single 12 VDC battery with a rating of the amp-hours of each pair added together. In this case 430 amp-hours using the 20 hour discharge rate. There is just enough room in the front compartment for adding another pair of batteries but that would add another 130 lbs. The batteries are mounted in a box which is vented to the outside through a hole in the bottom and a hose in the lid. Since the non-sealed batteries produce flammable gas, you would not normally locate any electronics in the same compartment. The vented box eliminates the risk. Plus, there are so many openings in the compartment for the landing jacks and slide hydraulic lines, there is plenty of fresh air. Battery/Inverter Cables: The inverter will be running at maximum output for very short periods of time. This inverter would run down the 440 amp-hour battery bank pretty quickly. 2/0 arc welding cable will be used for the battery interconnect cables as well as the battery cables. It has a free air rating of 283 amps (not in conduit). 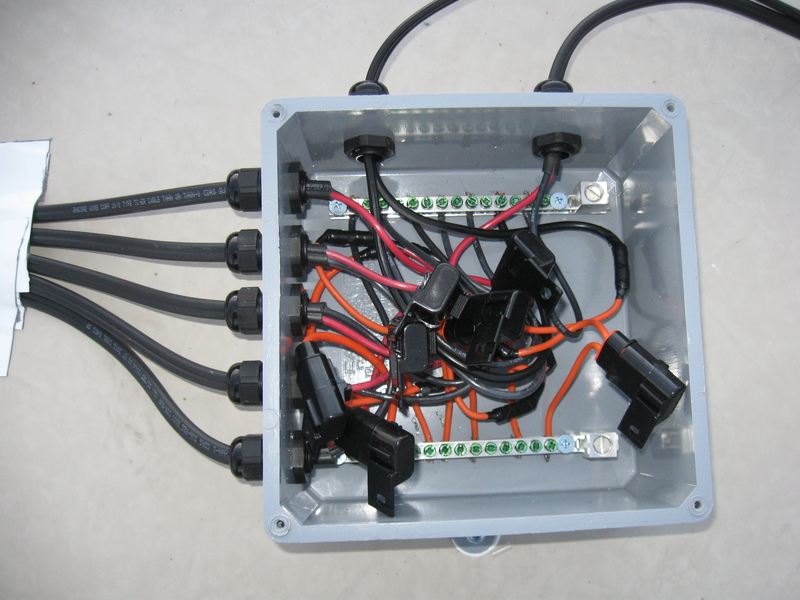 Solar Panel to combiner box: Two panels wired in parallel on each cable. 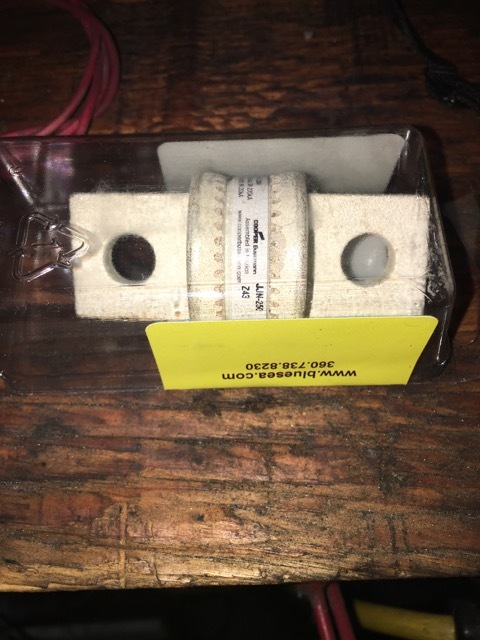 11.5 amps @18.9 VDC - 10 awg. 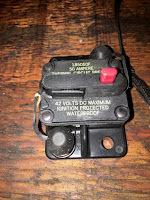 MC4 solar specific connectors. Combiner box to TS-45: Up to 45 amps @ 18.9 VDC - 4 awg. In my install, 23 amps @ 18.9 VDC going through a 50 amp circuit breaker located near the TS-45 controller. TS-45 to catastrophic fuse: 2 awg through a 50 amp circuit breaker. 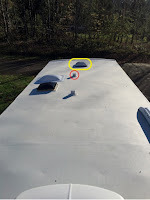 Combiner Box: This is a waterproof plastic junction box mounted on the roof where the 10 awg solar panel cables are tied together to a single feed from the roof to the charge controller. Using the voltage drop calculator on Calculator.net with 12 VDC and 45 amps, the voltage drop using 4 awg cable from the roof to the charge controller will be 0.17 VDC or 1.42% for a 7.5' one way run. The target is under 2%. 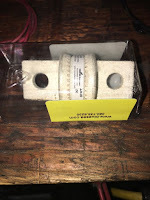 The photo is a combiner box using one made from PVC boxes and fittings from Home Depot or Lowes. This is from the Mobile Homesteading Solar Services website. One of several great resources. The inverter will be used to supply 110 VAC to the outlets including the microwave. It will not be used to run the air conditioner, the water heater and (obviously) the converter. Kitchen appliances such as the microwave and coffee maker will probably be the largest consumers of 110 VAC but their use will be limited. Primarily the AC power will be to charge devices, Bridget's CPAP machine, TV and network. All pretty low power consumers. There are several ways to provide the inverter AC into the RV. Inline, a transfer switch and dedicated outlets. I ordered a Xantrex 15 amp transfer switch which can be wired into one circuit of the existing electrical panel. Since I don't know how the 110 VAC panel is wired, I may or may not end up using that method. Ray from LoveYourRV.com wired his 1000 watt inverter to two dedicated outlets. One near the TV and the other in the bedroom. Anything plugged into those outlets will alway be running off of the inverter. If the automatic transfer switch won't work with the panel layout, then I'm going to take the inline approach. I will be running from the inverter to a 20 amp breaker in the pass through storage area ending in a 30 amp RV outlet that I can simply plug the RV power cord into. I will manually switch off the circuits on the main breaker panel that should never run off of the inverter. (A/C, water heater, converter) There is a switch on the refrigerator which can be used to force it to run off of propane. If AC is available, that would normally be the default. Other 12 VDC devices are the lights, furnace blower, refrigerator controls (and light), hot water heater controls, CO detector, water pump, slide hydraulic pump and controls, landing jacks (on the front) and the stereo. Of these the lights and furnace are the large consumers due to the length of time that they may be running. I will be changing out most of the lights with LEDs but I didn't make an inventory of bulb types when I was there. The next post will have a schematic and the initial assembly onto a 5/8" piece of plywood that will eventually simply be screwed into the front compartment. I can have it completely pre-wired. This is a long post that I started while recuperating in the hotel room in Seattle. Quite the posting RichardM....so glad you're blazing the trail for me on this project. I will be plagiarizing your efforts of course when and if I ever go solar. As far as the justification, just about anywhere you camp in AK is boondocking. Very few RV parks and most of them are in cities. Impressive research on your part, RichardM. Your blog will soon become quite the go-to-blog when it comes to RV related upgrades. Most of this is just notes reminding me of what I had decided and why. Plus, I kept losing the links to all of the sites that I've been reading. And there is so much inaccurate information on this topic by some who really don't understand some really basic electricity.